Garth Brooks has proven the adage, music is life to the soul. Most of his songs remain evergreen despite the long years they have been released. He has done well for himself as a musician, bringing music to everyone’s doorsteps; with his many tours and plenty albums. Brooks drives with a success syndrome and for every one of his albums, they have oftentimes topped the Billboard charts as well as earned him so many awards. Credits are given to Garth Brooks for his many works and of course, his money bag is smiling, well, you know what, one lesson Brook’s life teaches is consistency and diligence births success. Not everyone knows that the awesome performances displayed by the musician started with his many practices as a child. He started grooming his music skills when he was at a very young age. The first musical instrument he mastered was the guitar, learning was quite easy for Brooks as he had his mom as one of his teachers and with time he began working on his voice. He was born on the 7th of February 1962 in Tusla Oklahoma. Well, with music as his passion, Brooks went ahead to develop an added interest with sports. As a high school student, he played baseball, football, and sprint. He ran on an athletic scholarship at Oklahoma State University and also threw Javelin there. Garth Brooks while in school, had in check both his musical career and academics. He eventually didn’t drop out of school and graduated with a degree in advertising. Upon graduation from college, the vocalist focused fully on his career. He started out performing in clubs and bars before eventually going pro in 1984. With his skills, Gath Brooks kept on creating vibes but it didn’t actually make him famous until four years after he launched his career before he got to sign a deal with Capitol Records. With the record label, he released his debut single, Gath Brooks. Amazingly, his first professional track peaked at the number two spot on the Billboard Top Country Albums. Then, his track; If Tomorrow Never Comes became his next big hit. His next Albulm; No Fences spent over 161 as the number one spot on the Billboard Top Country Albums Chart and also peaked at the number 3 spot on the Billboard 200. This album in the later years became his highest selling album. Ropin’ the Wind, his third album like others balanced as the number one spot on the Billboard 200 for a few weeks and had already sold over 4 million copies before it was launched. Well, in the subsequent years, Garth Brooks kept on releasing many musical gigs and only fell short of his position (1-10) on the Billboard charts just once with his gospel track, We are Free. He was also embarking on tours to the delight of his fans. One of his tours then was said to have grossed over $105 million. When Garth Brooks was on the altar with his college sweetheart, Sandy Mahl, he must have felt that his marriage would last till death do them part. However, little did he know, that his marriage would one day be a thing of the past. Well, his first love; Sandy exchanged vows with him on May 24, 1986. They lived together in peace for a few years before trouble began in paradise and it eventually led to their divorce in 1999. The divorce led to his early retirement in his career and a divorce settlement of $124 million. Meanwhile, their union produced three pretty daughters; Taylor Mayne Pearl (born 1992), August Anna (born 1994), and Allie Colleen Brooks (born 1996). While enjoying his retirement, Brooks fell in love with Trisha Yearwood. A lady who has been previously married thrice. 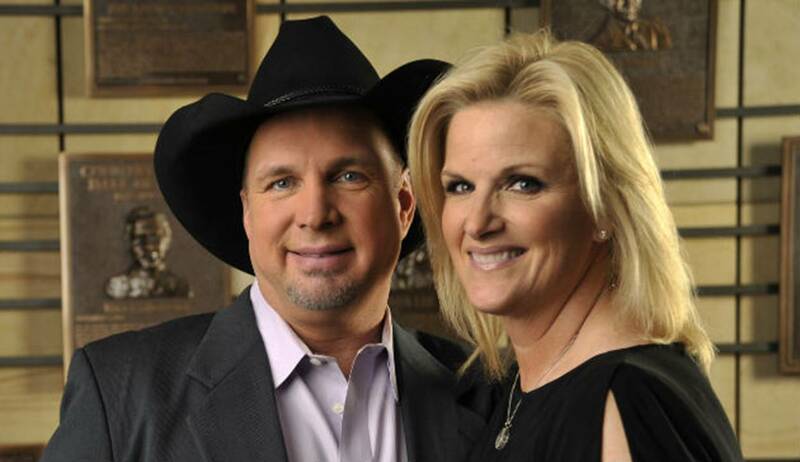 Garth and Trisha subsequently lit up their love lives with an engagement on May 25, 2005. A few months later, precisely on the 10th of December 2005, they officiated their union. In July 2013, Brooks became a grandfather as he welcomed a grand granddaughter named August. The guitarist is an offspring of Troyal Raymond Brooks, Jr. and Colleen McElroy Carroll and is their youngest child. His dad, while he was alive, worked as a draftsman for an oil company while his mom who passed on in 1999 was an era-country singer. Apart from his biological siblings, Brooks has four older half-siblings – Jim, Jerry, Mike, and Betsy. Looks like Garth Brooks wasn’t the only one known for his music gigs. His mom, Colleen McElroy Carroll was quite exceptional with music during her heydays. She was signed to Capitol Records in the 1950s, recording under the name Colleen Carroll. She released four singles in the mid-1950s. Colleen had a pause with her career and decided to concentrated with family. Unfortunately, she passed on after suffering from throat cancer. Brooks’ half-sister, Betsy Smittle also trod the path of a musician. She wasn’t just popular for her ties with Brooks but was also known for her contributions as a vocalist for Stillwater. She performed in 1991 in Brook’s album; Ropin’ the Wind, The Chase, In Pieces, Fresh Horses and the Double Live concert album. She died sometime in the month of October 2013.